House Republicans are to begin a three-day retreat Wednesday on Maryland’s eastern shore to regroup after a contentious year where the standing of the caucus’ leaders suffered (a 22% job approval rating) as they struggled with the party’s more conservative Tea Party wing. They hope at this meeting to emerge with an immigration proposal and strategies to present the party in a more positive light. One public perception faced by the Republican Party in general is that it is less willing than Democrats to work with leaders from the other party. Americans say by a margin of 52% to 27%—a difference of 25 points—that Democrats are more likely to show such willingness than Republicans, according to a survey conducted in mid-January. The survey also found that the public, by a 54% to 35% margin, views the GOP as more extreme in its positions. While the share of Americans who say they like elected officials who make compromises with people they disagree with has risen in recent years, the public is still divided on the question, with 49% saying in January they prefer officials who compromise while 48% liked officials who stuck to their positions. And, surveys have shown that when the question of compromise is asked about a specific issue—such as a deal to end last October’s government shutdown—support drops for giving ground. 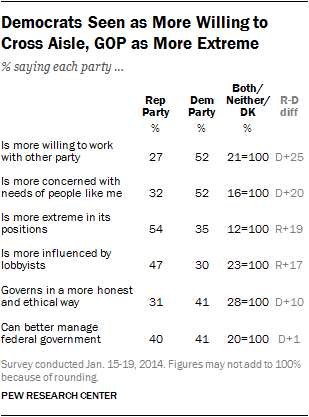 Republicans fare better when matched with Democrats on a number of other traits. The public thinks the GOP could do a better job than Democrats in handling the budget deficit by a 45% to 35% margin; they are about even (42% to 38%) on the economy, and they also run evenly with the Democrats on immigration (38% to 39%).